So that you know you are dealing with a competent and qualified company, check out our accreditation. Glasswells Commercial Flooring & Interiors are members of CFA & Constructionline, this is to make sure your standards are not compromised. You can be assured that we offer high standards of installation; our insurance documentation, financial, health and safety data have all been checked, saving you valuable time. We are pleased to announce that Glasswells Commercial interiors has been accredited by the CQMS Safety-Scheme which is dedicated to promoting higher health and safety standards and ensures that our policies and procedures are assessed in accordance with the SSIP Core Criteria and accredited by CQMS’ Safety Scheme as a contractor. 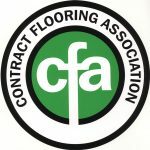 Why choose a CFA member to install your flooring? Flooring is a major element in most contracts and with more products to choose from than ever before obtaining the right installer has never been so important. Specifiers and main contractors require quality of service, installation and support which Contract Flooring Association members can provide. Consequently many public and private organisations and an increasing number of local authorities are now specifying that CFA members must be used. Constructionline is the UK’s largest register of contractors, consultants and material suppliers for the construction industry. As a verified member of Constructionline, our clients will recognise that Glasswells aligns to industry and government standards. Don’t accept anything less for your project.